$1 printable coupon off Fisher Nut Exactly Snack Bites! Click here to print a coupon for $1.00 OFF Fisher NUT EXACTLY item! You love snacking. But you want to feel good about the snack you love. You hunger for delicious ingredients with a satisfying crunch, but also a touch of sweetness. Made with roasted almonds and whole grain popcorn dipped in creamy milk chocolate, you’ve got a poppable bite-size snack that will keep you coming back for more. And more will never feel like too much. It’s not exactly almonds. It’s not exactly popcorn. It’s not exactly milk chocolate. It IS exactly every snack you’ve always wanted. It’s Fisher® NUT EXACTLY™ Snack Bites! Now save $1.00 on ONE (1) package of Fisher® NUT EXACTLY™ Snack Bites, 5 oz. or larger at either of the following retailers: Jewel-Osco, Mariano’s or TOPS. And, coming soon to Woodman’s, Dierberg’s and Menard’s. Blue Bunny Ice Cream – look for special offer in May 10th local newspaper! We LOVE Blue Bunny ice cream in our home! I’ve never tried a flavor I didn’t love. Chris is addicted to their Frozen Yogurt Caramel Praline Crunch. Seriously – we buy two at a time almost every week. And now that summer is almost here (finally! ), this is the time to start the season with savings on Blue Bunny ice cream!® This weekend – May 10th, check your local newspaper, because there is going to be a special offer on Blue Bunny ice cream cartons, cones, sandwiches and bars redeemable at a retailer near you! We buy ours at our local Walmart. But if you’re not sure where you can purchase it near you, click here to check out their product locator. Their products are located in all 50 states! 75% coupon code for cordless can opener from Kitchen Palz! Back in February, I posted a review on this cordless can opener from Kitchen Palz. I absolutely love this can opener, as it leaves no sharp edges. Well, they are now offering a 75% off coupon to purchase this on Amazon! And if you are a Prime member, you get FREE shipping, too! If you would like to take advantage of this amazing deal, click here and use coupon code RENQ8WHQ to score your 75% off coupon! $2 printable coupon for Poise pads! You deserve the best options for managing LBL, so Poise is giving you another solution this April: new Poise® Thin-Shape Pads. To make room, Poise® Hourglass® Shape Pads will be discontinued. Until then, they’re giving you a $2 coupon so you can stock up while supplies last. 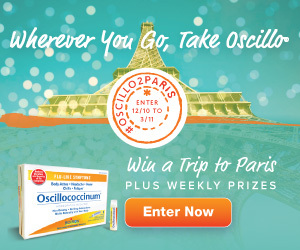 Enter to win a trip to Paris plus a $2 Oscillo coupon! Enter the “Wherever You Go, Take Oscillo” Sweepstakes for your chance to win a trip to Paris! This exciting #Oscillo2Paris sweepstakes kicks off today and runs through March 11, 2015. No purchase is necessary to enter. One entry per person per day. One GRAND PRIZE WINNER will receive a five-day, four-night trip for two to Paris, France. The prize includes round-trip airfare and airport transfers and deluxe hotel accommodations. Thirteen WEEKLY WINNERS will receive an Oscillo Travel Prize Pack—one box of Oscillococcinum 6 Dose, a signature red Oscillo scarf, and an official Oscillo luggage tag. All sweepstakes participants will receive one $2 OFF Oscillococcinum coupon with every entry. For healthy travel tips, a downloadable travel checklist, official sweepstakes rules, and how to enter the “Wherever You Go, Take Oscillo” Sweepstakes, visit Oscillo.comor Oscillo’s Facebook page. Good luck! 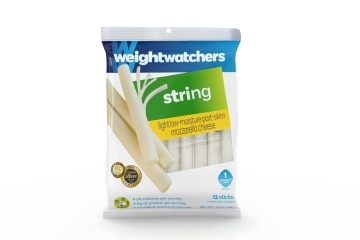 Weight Watchers String Cheese or Cream Cheese 75¢ off coupon! Have you been eating healthier as part of your New Year’s Resolution? Chris and I have both been trying to eat healthier. His work has even started a company wide contest, which started today, actually! One of his snacks he always packs with his lunch is string cheese. He loves Weight Watchers products, so I’m definitely going to be printing this coupon for 75¢ off! The string cheese comes in Light Mozzarella, Smoked and Jalapeno flavors. The sticks come in Cheddar and Colby jack which are reduced fat. All of WW snack cheeses are less than 70 calories and have 6 grams of protein which make them a tasty and healthy snack. The string cheeses are each 50 calories and the stick calorie count varies based on the flavor. The cheddar is 70 calories and the Colby jack is 60. PERFECT snack for dieting! I know that it costs more to eat healthy, but the average cost for Weight Watchers String Cheese are $3.90 for 12 string cheeses and $3.81 for 12 stick cheeses. We usually buy our Weight Watchers products at our local Walmart supercenter! Click here to grab your 75¢ off coupon!